Whew! I met all my goals for April! This is Promenade by Riley Blake. All strips are 2.5", and the blocks are trimmed down to 12.5". This was the first fat quarter bundle I bought. I also used some half yards of various Kona solids. The backing is pieced from various Heather Bailey and Amy Butler fabrics. The tan fabric is from Andover Fabrics. I quilted the top in 2" hearts, drawing lines to make it all straight. Once washed, it turned out perfectly. This is the most dense quilting pattern that I have ever used. I'm getting more daring. I had just enough 2.5" strips to make the binding. I love the scrappy binding. It works so well with this quilt. Don't forget, I finished two other quilts this month! Whew! I'm crazy! 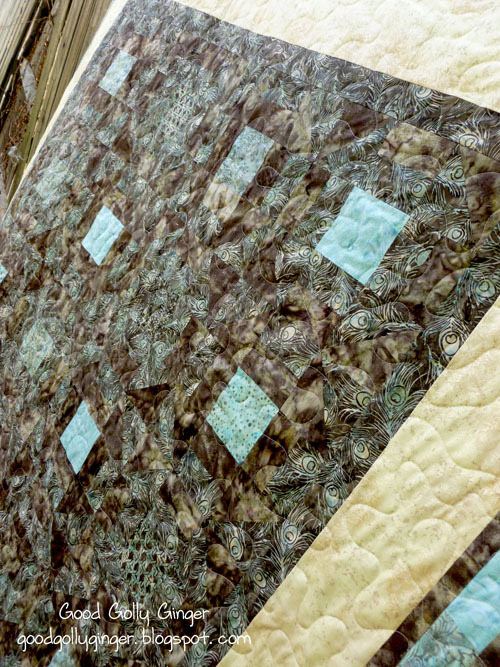 The churn dash quilt was made from batiks and a metallic fabric, and it looks so much more stunning in real life. This was recently given to a wonderful family friend, and it is much loved. 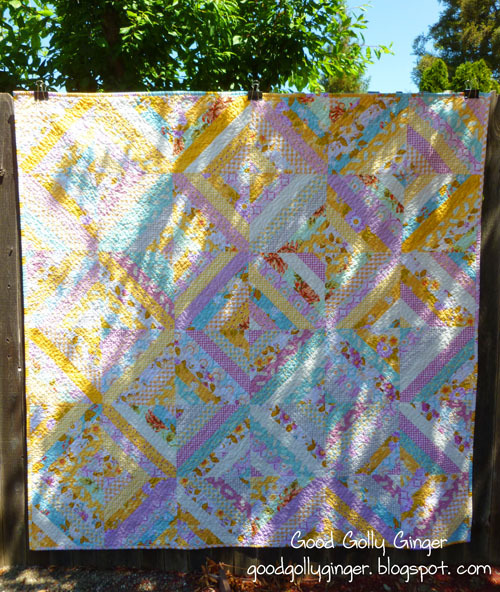 The Quilty Fun quilt was finished at the beginning of the month. It is currently at a local quilt show that will start in one week. I can't wait to see it on a wall. It's the first time I've entered a piece into a quilt show. It's so pretty! I love the yellows. They're so cheerful and calm at the same time. And three finishes in one month! Good on you. I love the strips quilt and fabric. It's pretty. Congrats on having a quilt in a show! I agree...breath of Spring! Thank you so much for stopping by! This is such a beautiful quilt Katie! such pretty colors, and the back looks fantastic as well! Thank you for hosting such a wonderful party! Thanks for visiting too! 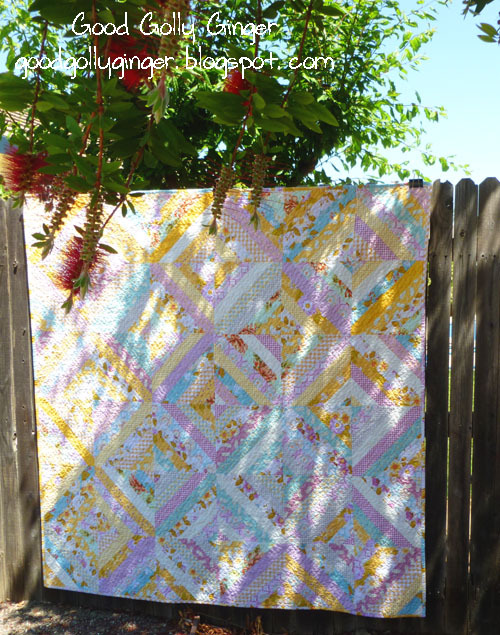 I love the Quilty Fun quilt - hope you enjoy having a quilt in a show! I will. Thank you so much for stopping by! 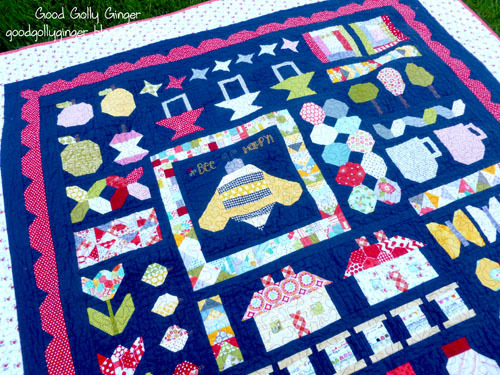 That Quilty Fun quilt is so cute. I think I like your version better than the one in the posts! Maybe the navy background with red outside? Good luck in the show! well done on all your finishes, your strip quilt is lovely! 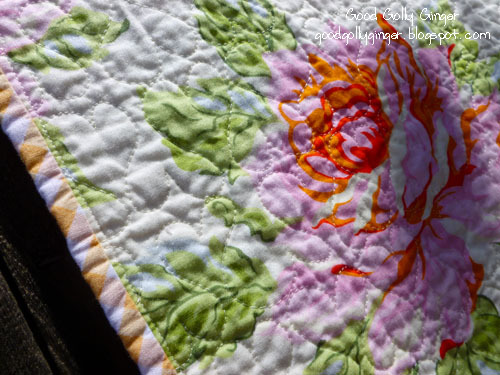 I love the heart quilting pattern, can't wait until I'm able to do FMQ like that... if it ever happens! I wouldn't have been able to do the heart FMQ pattern a year ago...It does happen! Thank you for visiting and have a lovely day! I literally gasped when I got to the third photo and HAD to immediately pin it. That collection was made for that pattern, isn't it lovely and wonderful when it works out that way? Why, yes, it is! Thank you so much for stopping by! This is such a wonderful quilt. Well Done You! Beautiful work - such a great colour combo - well done! Squee! What a beautiful quilt! I'm a huge string piecing fan myself, so I always smile when I see a string quilt. 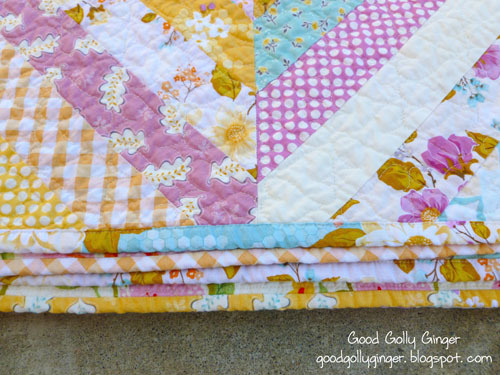 The colors, the quilting, the scrappy binding...it's all so, so pretty! Yay you! 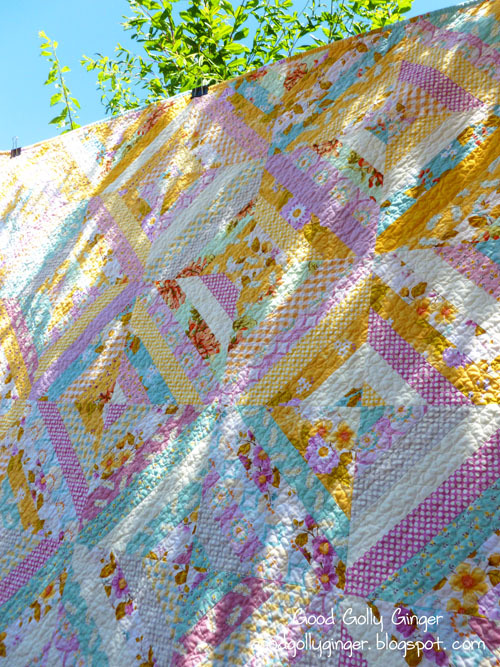 Oh what a beautiful string quilt! I love string quilts. 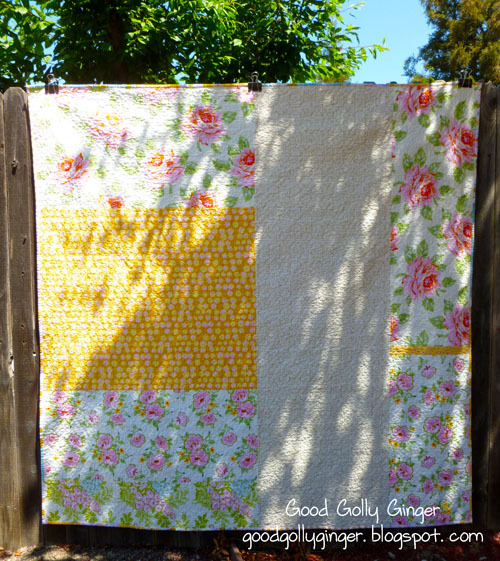 The summery fabrics you used a gorgeous. Beautiful back too. That first quilt is so impressive. Just love the color palette, it is just sweet and lovely. I love the heart quilting. How could I tell? Because I stared and air-traced with my finger until I figured out how you did it. Beautiful work!